New Release From 99 Cent E-Press. Mark Twain's classic as originally published. 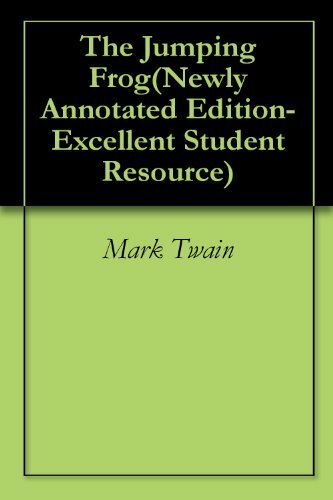 Mark Twain's "The Jumping Frog : In English, then in French, then clawed back into the civilized language once more by patient unremunerated toil" (1865), also known as "The Celebrated Jumping Frog of Calaveras County", "The Notorious Jumping Frog of Calaveras County" and "Jim Smiley and His Jumping Frog." Containing the original story (in english), a french translation which was published in la Revue des Deux Mondes and which Twain finds to be a travesty of the original text, and Twain's re-translation of the french back into english, word for word (this is where things degenerate). A masterpiece of babelfishien nonsense dating from well before babelfish was even a gleam in the binary code of its creator (1903). Best appreciated if you can read both French and English, but even if you skip the french version it's truly brilliant. If you have ever translated random text using babelfish just because it's funny, don't miss this book. 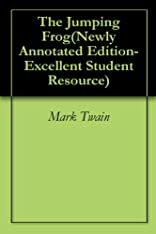 As good old Samuel Clemens himself put it in his foreword "I cannot speak the French language, but I can translate very well, though not fast, I being self-educated." Download this E-Book today in under a minute for less than a dollar for an incredible Kindle Experience!